The following article gives reviews on roles of the Sufi path, ʿAlawîyah Tariqa among ‘Alawîyyîn, to success their diaspora in Gresik regency using the socio-anthropological approach. It observes the ‘Alawîyyîn scholars as a group of migrants who adapt their Sufi path creatively with their new environment. Therefore, they have significant roles to keep their identity as ‘Alawîyyîn diaspora. It is found that rituals practiced by ‘Alawîyyîn in Gresik are reading râtib, h}awl and rawh}ah. In this context, the ritual has found aspects of the socio-anthropological values, as it involves a series of human creativity that has been shaping the culture, communication, and mobility in the social environment. From our view, the practice of the Sufi path, ‘Alawîyah Tariqa in Gresik, has become moral values that were internalized by its followers, and have been implemented by them as a behavior in the community. These rituals can keep their social-religious authority as ahl al-bayt (the descendants of Prophet Muhammad). Mahzumi, Fikri. 2014. 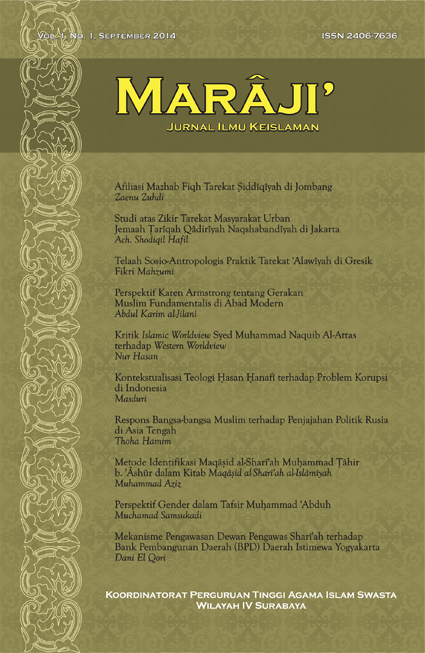 Marâji`: Jurnal Ilmu Keislaman 1 (1), 67-80. Accessed April 25, 2019. http://maraji.kopertais4.or.id/index.php/maraji/article/view/6.